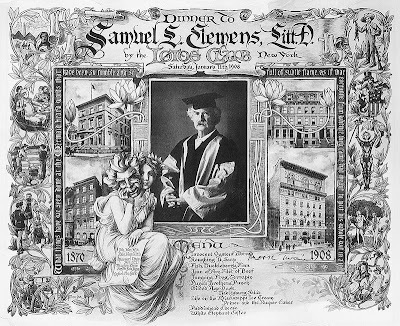 I celebrated my first blog-versary at the end of 2010 with a 2-part recreation of a dinner that was given for Mark Twain at the Player’s Club in NYC in 1906 (you can see it HERE and HERE ). It seemed the right thing to do since it was the Player’s Club’s menus that started me writing the blog in the first place and it coincided with the release of the Autobiography of Mark Twain. All the stars aligned. Discovering the crumpled folder filled with 100-odd years of menus that had been languishing in a file cabinet for decades was a huge thrill for me –– like buried treasure. I just had to do something with them –– that’s how Lost Past Remembered was born. It’s no secret that I love old menus. Beyond the fact that many of them are works of art with strikingly beautiful drawings and graphics, they give a solid connection to the cuisine of the times and in some cases, have the added benefit of having an attachment to history and its major players as well. All this from what were supposed to be ephemeral trifles –– only meant to exist for a brief moment in time. Lucky for us, some were saved. That brings me to one of my favorite blogs that belongs to collector and culinary historian Henry Voight, The American Menu . The brilliant former-NYTimes critic William Grimes was generous enough to introduce me to Henry and for that I am eternally grateful. Henry has one of the great menu collections that rivals the Buttolph at the NYPLibrary in its quality and scope. In the blog, he tantalizes as he lets us see a menu or 2 and then fills out the history with an infectious exuberance for his subject (backed up by laudable scholarship). I can’t wait for each new release –– they are always such a treat. 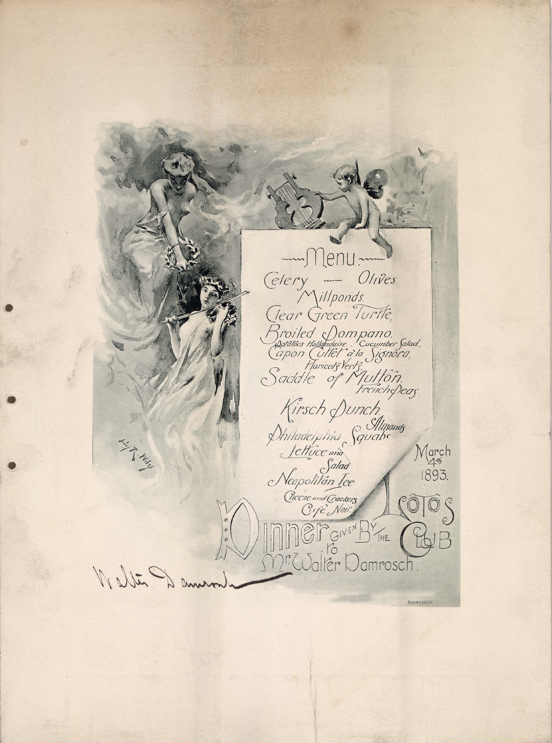 When it comes to the art of menus, many of my favorites come from New York City’s Lotos Club –– they had some of the best in the period around the turn of the 20th century. Although some are available online, I got a masterpiece from Henry’s collection when I asked him about them (he has 15 Lotos Club menus in his collection ranging from 1876 to 1983). Visiting the Lotos Club when I first came to the city provided me with an early introduction into NYC’s old art club society (The Players, The Salmagundi, The National Arts Club) that I came to love and admire –– they are “history on the hoof”. I still remember the custom Egyptian cigarettes that they had there in a remarkably elegant lidded box with the Lotos Club symbol engraved on the lid (bet those are long gone in this non-smoking city). 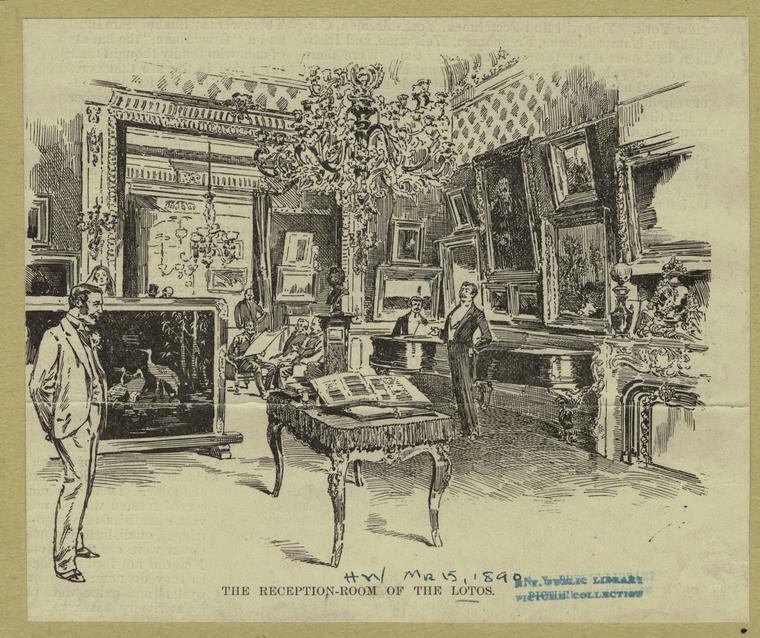 The Lotos Club was founded by a group of prominent artists, writers, scholars and journalists in 1870. 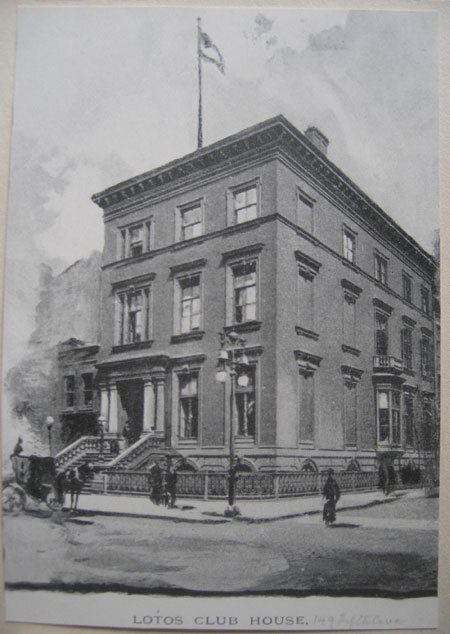 In its 140 years it has moved continually uptown from its first digs on Irving Place to 149 5th Avenue, then to 556 Fifth Avenue in 1892 and 110 w 57th in 1909. In 1947 it moved to its current location at 5 E 66th Street. 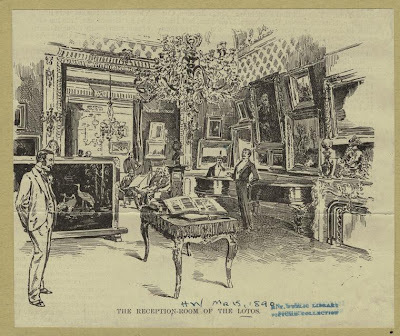 As a result of its commitment to promoting the arts, it has seen many art exhibits over its long history, and at one point maintained a very large collection of art of its members (sadly much has been dispersed but some fine works remain). Perhaps the menus are so remarkable because of the large representation of the art community in its membership. Many of the names on these historical menus –– so famous then ––are unknown or barely known today. Some of musicians, like Paderewski and writers like Mark Twain are still well known, but other names need a Google visit to find who they were. Some of the names names are vaguely familiar –– you just needed a nudge to remember them . 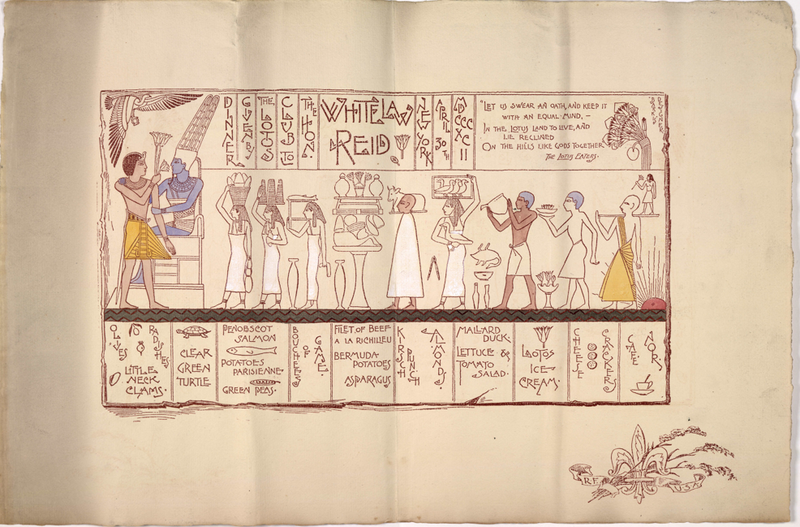 The Egyptian themed menu for publisher and Ambassador to France, Whitelaw Reid –– is a great favorite of mine. I was unfamiliar, however, with Whitelaw Reid. It turns out he was a very important figure in politics in the 19th century and at the time of the dinner –– running for Vice President with Benjamin Harrison (they lost to Grover Cleveland). One wonders how well our famous men will fare in 100 years… will anyone know who Rupert Murdoch was in 2100, or Mark Zuckerberg? Do you remember who invented the gasoline-powered automobile (Karl Benz snagged the patent in 1886)? 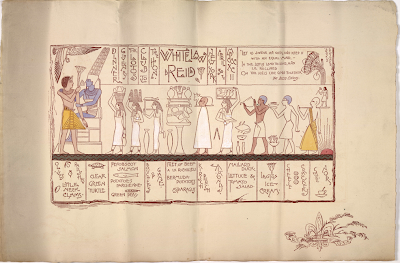 Perhaps then-ambassador Reid had a liking for the style (Egyptian style had been in fashion on and off since the time of Napoleon) but his diplomatic posts were to France and England, not Egypt –– no matter, the wonderful colors and graphics on the menu are arresting. 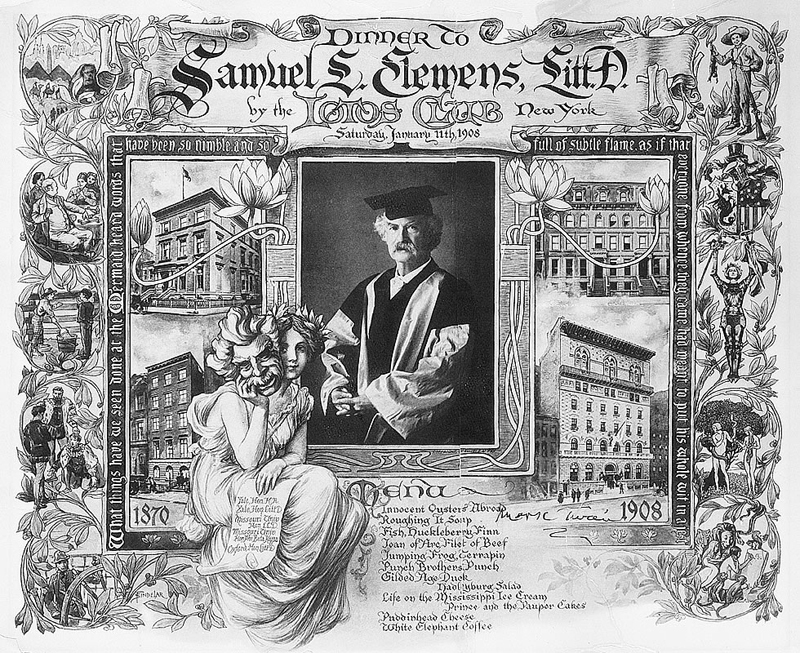 The food was not Egyptian, but rather classic food of New York at the end of the 19th century. I can imagine dinners in the 5th Avenue iteration of the club –– wine-red, tasseled, gilded, and dripping with crystal –– very Victorian. The dishes on menu are fairly recognizable today. The green turtle soup and clams (or oysters) seemed to begin many club meals. The Penobscot is an Atlantic salmon from the cold waters of Maine’s Penobscot river would have been baked or sautéed with a sauce. Potatoes Parisienne are tiny potato balls, sautéed in butter then glazed with a meat glaze (made these, they are terrible good). Bouchees of Game are cut up bits of cooked game in a game sauce seasoned with salt and pinch of sugar and placed into small cooked puff pastry shells (these would be only around 2 ½” so quite small), small enough to pop into your mouth and great for an hors d’oeuvre. Beef a la Richelieu is fairly straightforward –– a demi glace is poured over a tenderloin and, at least at Delmonicos Restaurant, it was served with braised celery, stuffed tomatoes and glazed lettuce on a bed of rice with simple potatoes and a madeira sauce. Kirsch punch is a refreshing alcoholic slushy and palate cleanser that would be delicious with almonds to snack on. This was followed by Mallard Duck and a simple salad. Ice cream was the usual finish to meals at the Lotos Club with the ubiquitous cheese and crackers and coffee at the end. You don’t need any memory refreshment for Caruso–– he was the greatest opera singer of the 20th century… perhaps ever. 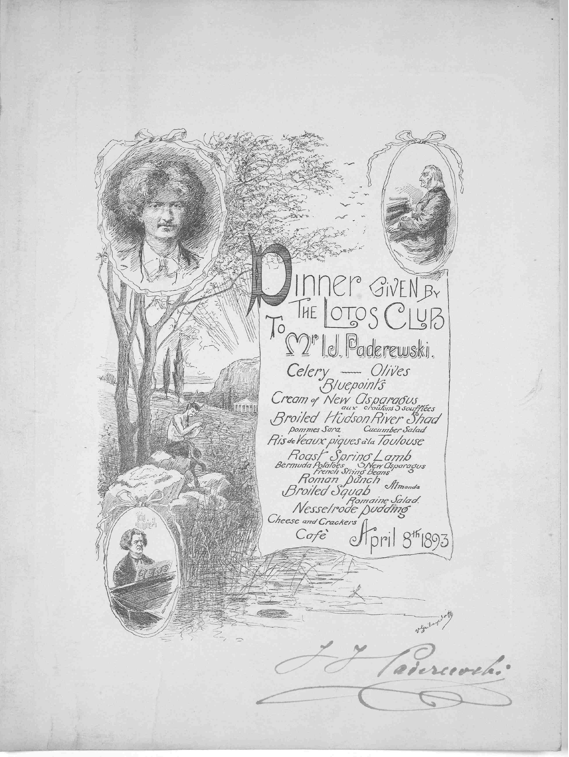 As in the first Twain menu, the Caruso menu (courtesy of the Voight Collection of menus) is fraught with difficulties when attempting a culinary translation. The menu follows the traditional pattern of the other club menus you see here but the dishes are named for Caruso’s triumphs. Henry told me that what I thought was odd phrasing “dinner to” was short for “dinner tendered to” and was commonly used at that time. The list of dishes includes oysters and soups and fish and filets and squab with ices and cakes, but only the lucky attendees would know the particulars of the courses. There’s no way to know what Samson Squab or Radames Filet or Nemorino Ices may be. Still, it is a glorious engraving, isn’t it? The characters, the poses… it is a treasure… even signed by Caruso himself (this is not unusual, it was a fashion in the day that attendees would sign the menu) –– the mystery of the courses is part of its charm. All the Lotos Club menus I’ve seen do follow well-worn paths when you put them together. Usually oysters or clams to start, then a turtle soup, then a sauced fish, a sauced meat, some vegetables and salads along the way with a wild bird flying in from time to time after a refreshing punch. Then ice cream is offered, in one form or another–– Lotos Club Ice Creams are seen most often followed in popularity by Nesselrode pudding (I wrote about that HERE –– it’s another ice cream but a complicated mix of chestnut ice cream, liqueurs and fruits). Sometimes there were cakes or petit fours. The name Walter Damrosch might ring a bell if you are a classical music buff–– he was the director of the New York Symphony orchestra (he was the first conductor of George Cershwin’s American in Paris) as well as a composer through the 1930’s –– he died in 1950). The Damrosch menu had Neapolitan Ice for dessert instead of straight ice cream or Nesselrode pudding and that encouraged some investigation –– I wasn’t sure I knew what that was –– because the Neapolitan Ice Cream I had as a kid was nothing to write home about. Not to worry, Neapolitan Ice is a classy version of the Neapolitan ice cream of my youth (whew). It was a tri-colored (supposedly after the Italian flag) ice cream molded into a layered loaf that often had a fruit sorbet decoration. I used pistachio, strawberry and vanilla, (pistachio, not chocolate as became the later fashion, but the combination is up to you ––use your favorites). I wanted to make it as soon as I read about its original recipe... kind of an iced, edible Spring with fruit, nuts and soft colors. One of my biggest food heroes, Ivan Day, showed a gorgeous tin mold that included 3 roses atop the rectangular container that were made with sorbet on his website, Historic Food. The mold was from the same period as the Damrosch dinner. I don’t have that mold, but I do have a rose mold so I can make something like it. If you don’t have an ice cream mold you could use a rose cupcake mold or just a scoop… the flavors are amazing together. I made mine with raspberry and Aftelier's Rose Absolute (again not an historical recipe but delicious), the result was one of the most magical things I ever tasted... pure raspberry flavor and rose that melts in your mouth will have you melting with pleasure! This is definitely the best sorbet I've ever made. You can make your base from scratch and that is the best way of course –– OR –– you can use a favorite cheat of mine that I started using when I wanted lemon ice cream in a pinch years ago. Buy a quart of vanilla, let it soften and add your fresh flavorings. In this case, divide it into 3rds and add strawberry puree to one, pistachio to the other ( I used my favorite pistachio ice cream recipe with exotic flavorings that is not a 19th century recipe but so delicious) and leave the vanilla more or less on its own (I added madeira). Layer it in a mold, re-freeze and you have your dessert. The sorbet can be purchased or you can make it yourself. If you buy the basics you can make it in a snap, if you do it from scratch it still isn’t a huge effort and wow, what a dessert! PERFECT FOR MOTHER'S DAY!!! Cream the egg yolks and sugar. Scald the milk and cream and add it slowly to the eggs, whisking all the while. Put it back in the cooled saucepan. Bring it up to 170º slowly, stirring all the time. Add the salt and vanilla and strain. Put in a bowl over a bowl of ice to cool down then put in the fridge covered. When chilled for a few hours, put in your ice cream maker and then make your ice cream blends. 1 drop Aftelier Rose Absolute or to taste (it is very powerful so add it lightly, too much overwhelms, just the right amount and you have heaven) OR add rosewater to taste –– up to 1 T.
Boil 1 c water and sugar to dissolve. Simmer for 5 minutes. Pour into a container and freeze for 15 minutes. Mash or blend the strawberries, sugar, lemon and cassis and let sit for 1 hour. At this point you can add the mixture to your ice cream to taste (you may want to add more or less) and put in a cold bag in the freezer –– you don’t want it to harden or you won’t be able to spread the layer well. Grind the pistachios, sugar and spice to a crumble of pepper-sized pieces. If you are making your own ice cream, this would be the one to do separately. If so, let the pistachio mixture steep with the cooling ice cream mixture then refrigerate. Strain before putting the mixture in the ice cream maker (if you don’t strain the pistachios, your ice cream will be grainy… your choice). If you are using vanilla ice cream, combine with the ice cream in a food processor, then strain, pressing hard on the solids. If you want it a little greener you can add a tiny dot of green and yellow food coloring… but seriously TINY dots. I put mine in some of the melted ice cream and then added a few drops of that to get a very delicate green –– you don’t want it to be blue/green. For me, the gold of the eggs in the ice cream made it the perfect pistachio color. Refreeze for an hour, stirring it from time to time. Stir the madeira and salt into the vanilla ice cream. Place in the cold bag in the freezer to keep it softened to spread. Take a rectangular mold (use 2 small or one large) and lay one layer of pistachio ice cream on the bottom and freeze till firmed somewhat. I put the other 2 ice creams in a freezer bag in the freezer so they would stay loose. Then add one layer of vanilla and top and freeze (make sure you stir the ice cream before spreading so there is an even consistency). Make sure you check for bubbles on the side which would spoil the clean look. Finish with one layer of strawberry when the vanilla has hardened enough to spoon on the strawberry –– you don't want to disturb the layers. Fill 2 rose molds with the sorbet if you have them. For all of you who ever thought of writing a cookbook, visit Justin at Just Cook NYC, he has some great advice. He should know, he edits them! Ah, to have lived in Old New York (with a lot of money!). Such beautiful menus. You don't see artistic style in most menus today - the only place I ever remember such care being given to the look of a menu is Chez Panisse. By the way, the Neopolitan Ice is gorgeous - a far cry from the dessert I remember as a kid! Thank you for this interesting piece of NYC history...and that elegant dessert so perfect for Mother's Day. Deana this was such a fascinating view of old New York. I would love to see some of those menus in person. Your gorgeous molded ice cream dessert is simply exquisite...what a spectacular Mother's Day dessert that would be. I love the idea of the garam masala in the pistachio ice cream. And btw...the dish that gorgeous ice cream is sitting upon is stunning...I must say I covet many of your dishes and plates! I remember that post in 2010! I was fascinated then and still am captivated by your research and love of history menus. Your photos and staging are beautiful. Due, I'm sure to your talent in movie staging! Loved reading how you got started. My computer teacher started me....you love to cook, why don't you blog? And took me to blogspot and introduced me. Fun to be introduced to American Menu and Voight. And what an exquisite collection of reprints in your post. I so enjoyed perusing every one. The art of menus is history, I'm afraid, althougn once in a while, you come across a beauty. Your stories of old New York are always a pleasure to read; one can only dream about taking part. What fabulous ices and ice creams. Pistachio is one of my favorites and how unusual to find garam masala in the ingredient list. For some unknown (probably something from childhood) reason, I love pistachio with angel food cake. Odd, I know. Super post, as we've come to expect! Such research and your love and interest shine through. Now THAT'S a Neopolitan I'd actually like to eat! 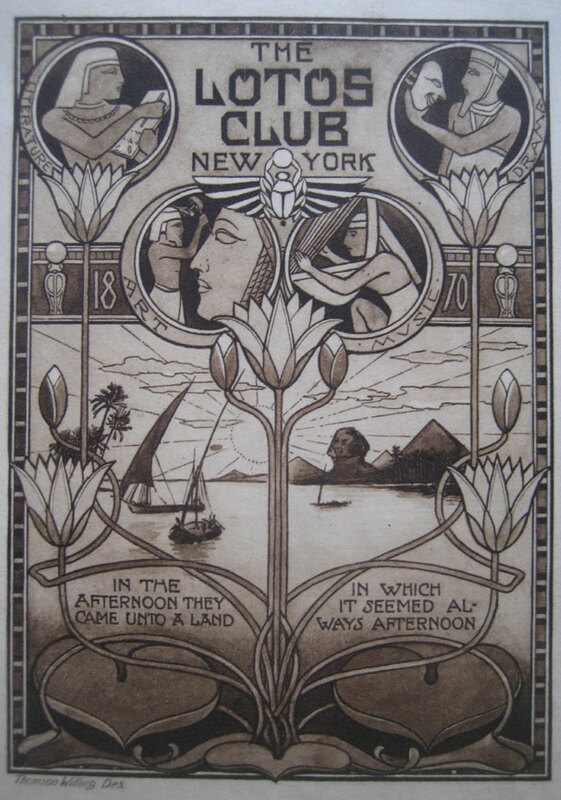 I greatly enjoyed reading about the Lotos Club. Do you think their clubs were as stuffy and upity back then as the new artist clubs are today? I'm always fascinated by these old clubs where people used to go to smoke, read and exchange ideas and old New York especially interests me. I had no idea about the link of the cration of this blog to Mark Twain so we have another thing to be thankful to him for. 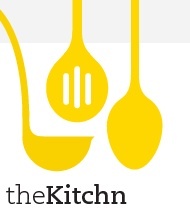 Thanks to you for another wonderful post and an amazing recipe. I truly think you should write a book with your lovely photos because you make such wonderful but different things. I love Neapolitan ice. I love revisiting the hayday of an era like this...old New York culture is especially fascinating. I would have loved to have been around at that time, but at least we can still enjoy the foods that they relished. This cake is a masterpiece and I love how ethereal it looks in your photos. Love your blog, old menus and this ice cream... yea I am following you now!!! I SO REMEMBER eating this special treat as a child SOMEWHERE very special. The grocery store versions were OK, but I do know that someone in our family circle served up the real thing once and YOURS IS TOTALLY BEAUTIFUL!! 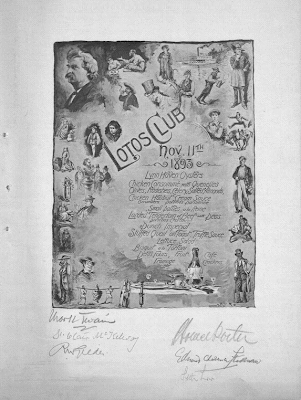 I have 59 Lotos Club Menus by Charles or Thomas Scindelar. We inherited these beautiful menus about 30 years ago. We have the Samuel Clemens, Cruso, Howard Taft, Pershing, the Prince of Monaco, Alfred E. Smith, Howard Elliott and many, many more. They used to hang on the walls of our home, but now that we are retired, moved to a small home, they are kept in portfolios. It is a shame that no one can see them anymore!! Ruthann,those are my favorites. Are you in the NYC area?